Indian Army published recruitment notice on their official website. The last date for submitting documentation for the post is 21st February 2019. The details eligibility and application process are given & mentioned below. भारतीय सेनााने त्यांच्या अधिकृत वेबसाइटवर भर्ती नोटिस प्रकाशित केले. भारतीय सेना जमिनीवर आधारित शाखा असून भारतीय सशस्त्र दलांचे सर्वात मोठे घटक आहे. शॉर्ट सर्व्हिस कमिशन (एसएससी) आणि शॉर्ट सर्व्हिस कमिशन फॉर विधो (एसएससीडब्लू) च्या पदांसाठी 191 जागा आहेत. 21 फेब्रुवारी, 2019 च्या पोस्टसाठी कागदपत्रे सादर करण्याची शेवटची तारीख आहे. या पोस्टमध्ये स्वारस्य असलेल्या आणि पात्रता निकषांनुसार त्यांनी त्यांचे फॉर्म सादर करावेत. तपशील पात्रता आणि अर्जाची प्रक्रिया खाली दिली आहे आणि खाली नमूद केली आहे. 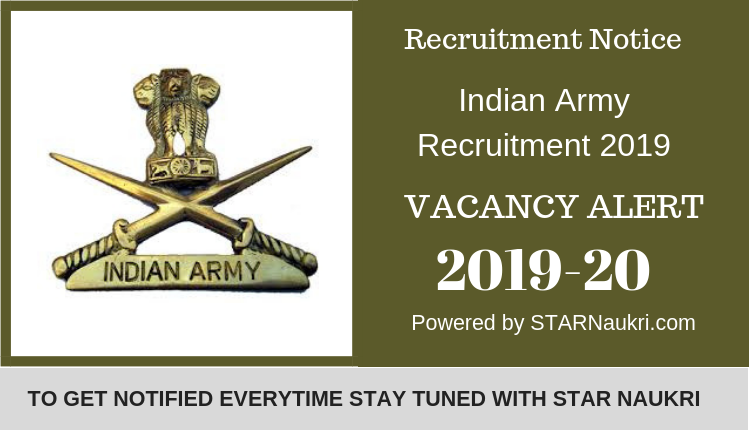 Indian Army published recruitment notice on their official website(www.joinindianarmy.nic.in). The Indian Army is the land based branch and the largest component of the Indian Armed Forces. There are 191 vacancies for the posts of Short Service Commission (SSC) and Short Service Commission for Widow (SSCW). The last date for submitting documentation for the post is 21th February 2019. Those who are interested in these posts and according to the eligibility criteria they should submit their forms. The details eligibility and application process are given & mentioned below.